Schepens provide an efficient and cost-effective removals service to Germany that does not compromise on quality of service. We have been performing international removals for more than 100-years and specialise in providing removals to Germany. Our talented and highly experienced staff can make your move simple and stress-free! Even though our rates for removals to Germany are very affordable, we provide a very professional removals service with a very high level of customer support. The regularity of our removals to Germany also means we can offer clients much more flexible removals schedules. We use a fleet of modern removals vehicles which travel to Germany on a regular basis. These vehicles run on air ride suspension and boast an adjustable barring system, which ensures little or no movement of vehicle contents. These bars also enable us to create partitions between consignments which prevents cross contamination. Why use Schepens for removals to Germany? Schepens have been in operation for more than 100-years and have a vast amount of experience performing international removals. We take great pride in the high level of customer support we offer our clients. Our experienced move co-ordinators will walk you through every step of the process, answering any questions you have and giving you updates on the day of the move. 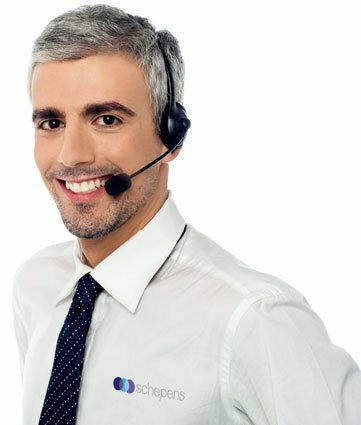 Here at Schepens, we take great pride the reputation of our company and always strive to provide the best customer service in the world. Our talented staff are all trained to British Association of Removers Standards, which gives you the certainty that they will perform the job to a high standard. Our specialist vehicles have been designed to safely move freight for long distances and are perfect for the move from the UK to Germany. We use high-quality package materials for the journey including packing boxes, moving blankets and straps. All vehicles are driven by fully trained and insured professionals. Our vehicles are also alarmed, offering additional security and peace of mind for all removals to Germany. Why risk packing your possessions incorrectly for the long journey and suffering a breakage? Our experienced movers can make sure your valuable possessions are appropriately packed for the journey with our professional packing service. Let our move co-ordinators take the hassle out the move by filling out customs paperwork on your behalf! We offer a range of affordable insurance options for removals to Germany, which are designed to suit any type of freight and budgetary constraint. We also offer extended liability cover, which takes care of damage that occurs to third parties. In the unlikely event that an accident does occur, our move co-ordinators will take care of the paperwork for you. If you would like your possessions to be placed in storage, we can accommodate you very easily. We have multiple, highly-secure storage depots located throughout Europe and offer very affordable rates. Berlin, Hamburg, Munich, Cologne, Frankfurt, Kiel, Nuremberg, Stuttgart, Dusseldorf, Dortmund, Essen, Bremen, Dresden, Leipzig and Hanover. If you need removals to Germany, then Schepens has the experience, expertise and local knowledge to offer you a smooth, trouble-free move. You will find that when dealing with any kind of officialdom in Germany, you will need to prove your residency (i.e. registered address), so let’s get that out of the way first, and everything else is easy (relatively)! Within a week of finding permanent accommodation (i.e. not a hotel), you have to register your address at the local Residence Registration Office (Einwohnermeldeamt), usually located in the town hall (Rathaus). Each subsequent change of address must also be registered with the relevant local authority. This rule applies to everyone, including German nationals. To register you need to present your passport, a copy of the lease or rental agreement and a completed registration form (available at the town hall). Opening times vary, particularly in the afternoons, so check before you go. If there are no problems, you will be given a confirmation form (Anmeldebestätigung) as proof of your registration. Make a copy (or several) of this as you will need it a lot during your first weeks in Germany. This serves as a proof of your address and a lot of institutions (banks etc.) will ask for it. Opening a bank account is a straightforward process in Germany. However you often need to show some proof of earnings so it isn’t a bad idea to bring along your employment contract stating your salary and any bonuses. If you want an overdraft (Dispositionskredit), or credit cards you will have to prove a credit history, so as a new arrival, this may not be possible for the first 6 months. As in the UK the amount of this credit is normally related to your monthly income. Be warned, interest rates are usually a little higher than UK so consider to use credit sparingly. The most common form of account in Germany is a Girokonto (i.e current account), when you open your account you can apply for an EC (ie ATM) card, which you should get within 2 weeks. Withdrawing money from your bank using an EC-card is normally free of charge, but a fee may be charged for withdrawing money from other banks’ ATMs. Each city, town and/or local municipality has a state-owned bank called a ‘Sparkasse’. These banks are the bank of choice for those who enjoy a more personal relationship with their bank. The banks usually have strong relationships with local businesses and offer more branches, especially in smaller towns and villages. However, many people find these banks to be far too bureaucratic and inflexible, especially when it comes to international transactions. The rate of income tax in Germany ranges from 0% to 45%, with VAT generally rated at 19%. A reduced tax rate of 7% applies on sales of certain foods, books and transport. Germany also has a double-tax agreement with UK. The obligation to file an income tax return does not apply to everybody. For example, single assessed tax payers who exclusively earn income subject to withholding (ie pay-as-you-earn) tax are exempt from this obligation, because their tax debt is deemed to be at least settled by the withholding tax. Nevertheless, any person having full tax liability is allowed to file a tax return, taking into account the tax already withheld at the source and possible deductions. In many cases, this may result in a tax refund. Married couples can apply for joint assessment to be taxed at a more favourable rate. In this case, they must file the annual tax return as it is possible that the tax paid through withholding tax was not sufficient. Property acquisition tax (Grunderwerbsteuer) is regulated by the federal tax law, and is currently 3.5% (incl. VAT) of the purchase price. In addition, municipalities levy a tax on real property (Grundsteuern). The tax rates vary because they depend on the decision of the local parliament, this tax is payable every quarter. If you are neither resident in Germany nor have your normal place of abode there you are only liable to pay tax in Germany if you earn income there which has a close domestic (i.e. German) context. This includes in particular income from property or else from a permanent establishment in Germany. Generally speaking, Germany with its toll-free no-limit autobahns is the place to be for drivers, even your UK licence is valid for its duration, but beware there are a few things that might catch you out. A tax clearance certificate (Unbedenklichkeitsbescheinigung, isn’t that a great word! ), to confirm the vehicle has not already been registered in Germany. To register your car will require a visit to the local Vehicle Registration Office (Kraftfahrzeugzulassungsstelle), Click hereto find your nearest office. Statutory roadworthiness tests (i.e. MOT) are done by either TÜV(Technische Überwachungs-Verein) or DEKRA(in the former East Germany). Cars that were purchased new must be inspected after three years, and thereafter all cars must be inspected at two year intervals. It is law (since 2010) that all cars and motorbikes (including foreign vehicles) are fitted with winter tyres when conditions are snowy. So, to be on the safe side, and not get surprised by a sudden snowfall most Germans put their snow tyres on in October, and take them off again only at Easter. If you are caught by the Polizei driving in snow without them you will be fined. In addition, and only where specifically signposted (e.g. in mountain areas), snow chains must also be fitted. Many German cities require you to display a sticker confirming your vehicle meets environmental requirements. For residents these Emission Badges are available from a wide range of outlets including repair centres, car dealers, MOT (TÜV or DEKRA) stations etc. The stickers cost approximately 6 euros, depending on where you buy them, and are valid for the life of the vehicle anywhere in Germany. For visitors there is also no escape, but at least it’s possible to purchase a sticker on-line before driving to Germany (so saving you the hassle of finding a sales point once you have arrived), using this link. As with stickers purchased anywhere in Germany they are valid for the life of the vehicle and for use in any German Low Emission Zone. Obtaining car insurance in Germany is pretty much like in UK, find yourself a local broker in your nearest town and away you go. All vehicles must have at least third party insurance, and the certificate (Versicherungszertifikat) must be carried at all times. Don’t forget, if you have a good driving record in UK they will even give you credit for it here, as long as your UK broker will give you something in writing. If the German agent says you can’t get this credit try another, as you can make considerable savings. Don’t let the high speeds on German roads fool you, there are, in fact, many sections of the German Autobahns that have speed limits, so, keep an eye open for them. Speeds are usually restricted (e.g. to 100Km/h) on bends, over bridges, and when approaching cities, also, at peak times overhead gantry signs will dictate the short-term speed limit. Generally speaking Germany is lenient on speeding, only incurring small fines, but exceeding the limits by more than 30 km/h may lose you your license for upto three months. All drivers are required by law to carry a first-aid kit and a red reflective triangle. If you have an accident, you must stay at the scene for at least thirty minutes, and as in UK must exchange insurance and contact details with anyone else involved in the accident. A tough points system is used with increasingly strict fines especially where drugs or alcohol are involved (over 0.05 per cent and you could face fines, endorsement or even imprisonment). Just as in UK radar speed-traps are frequent in Germany (and they are not so easy to spot), and heavy on-the-spot fines can be levied. From 3 to 6 years (and perhaps from age 2 in certain areas) the very young ones can attend Kindergarten; some are public, some are religious and others are private. Most of them are open all day to tend to take the kids in either morning or afternoon sessions, from 7am-ish for working parents, to 3pm, with lunch provided at a small extra cost. If you need a KG place, as in UK it’s a good idea to get your child’s name on the list as soon as possible. Secondary education, is divided into two levels: junior and senior secondary education. Upon completion of the Grundschule (from age 6 to 10), pupils between the ages of 10 and 16 attend one of the following main types of secondary schools: the Hauptschule, the Realschule, or the Gymnasium. Students who complete this level of education receive an intermediate school certificate. The Gymnasium (ages 11-18), (ie Grammar school in English), begins upon completion of the Grundschule with satisfactorily high marks in key subjects (e.g. maths, Science etc). About one-third of all primary school graduates attend a Gymnasium, which gives them the right to study at the university level (by gaining the Abitur school certificate). Another one-third of primary schoolchildren attend the Realschule (from 11 to 16), this is deemed to be the ‘normal’ route in Germany, with students seeking access to middle levels of government, industry, and business. Graduation from the Realschule enables entry to a Fachhochschule (a higher technical school). A special program makes it possible for a few students to transfer into the Gymnasium (thereby giving them direct access to a University education), but this is exceptional. Kids that don’t make the grade for the Realschule will attend the Hauptschule, with the curriculum stressing preparation for a vocation. After receiving their diploma, graduates either become apprentices in shops or factories while taking compulsory part-time courses or attend some form of full-time vocational school until the age of 18. Germany has one of the most highly regulated labour markets in the world, with its Labour law designed to protect employees. Whether or not an employment contract exists, all employees have basic rights to such things as holidays, sick pay etc. But, despite what the UK news may tell you, finding a job in Germany isn’t easy – especially as a foreigner. UK citizens do not need a permit to work in Germany, provided they have a valid passport and comply with German employment laws and regulations. You should, however, consider getting an EU residency permit. In Germany, UK citizens have equal rights in terms of pay, working conditions, access to housing, vocational training, social security and trade union membership. Families and immediate dependants are entitled to join you and have similar rights. There are some restrictions on some public sector employment (e.g. Police) and there variances for teachers and health professionals between different German states (Länder). Most companies have an employment probationary period, usually specified in the contract of employment, in most cases a duration of up to 6 months is applied. During this period, you are entitled to the income agreed upon and proportional holiday entitlement, until the probation time is up, the term of notice is from 1 to 14 days! If you wish to be Self-employed in Germany, the rules and regulations vary depending on what sort of business you plan to engage in, however, there is a some very useful guidance available herefrom the German Government telling you just how to go about it (and it’s in English). Salaries in Germany are among the highest in Europe (if not the world!). Salary is stated monthly in your employment contract, which should also detail any special benefits, bonuses and salary reviews. Many employers pay a 13th monthly payment a year, which is normally paid out in December (i.e. just in time for Christmas). Many foreigners need some time to adapt to the German attitude to work, with their strong emphasis on efficiency. Management culture in Germany is usually highly hierarchical. Germans like to work on well-thought-out plans and make factually-based decisions. Orderly and well scheduled meetings form a large part of what tends to be a consensual, group approach to decision-making. Punctuality is expected and lateness is not tolerated, so be careful if you like to sleep late. Employees are represented by the works council (Betriebsrat) whose members are elected by the workforce. Among other things, it is responsible for protecting employee rights in the workplace. Management must also consult with the Betriebsrat about issues regarding staff or the company. If you have problems in your workplace, you should consult your Betriebsrat for advice and help. Medical treatment can be hugely expensive in Germany, so health insurance has been obligatory for everybody in Germany, including the self-employed, since 2007. The company pays half of the insurance contributions, the other half comes out of the employee’s salary. The employee’s half usually totals around 10% of their gross salary. When starting work the employee won’t have to worry too much about how the system works. The company will automatically sign them up with an insurance company and the contributions are automatically deducted from the salary. Sometimes the employee may be asked if they have a preferred insurance company. It is recommended to simply go with one of the big names, like “AOK” or “TKK”. They are all pretty similar. Although it sounds like the USA it actually operates like the UK NHS (only better). The German Mardi Gras or Carnival celebration goes by many names and is a movable feast that is related to Easter, beginning the week before Ash Wednesday. Festivities begin in all towns and villages with electing a carnival prince and princess who preside over the carnival festivities. Then, women throughout the day will snip off men’s ties and kiss any man that passes their way. The day ends with people going to local venues and bars in costume. Carnival parades also abound, it is literally the weekend for people to live it up, with the largest and most popular carnival parades taking place on the Monday (Rosenmontag) before Ash Wednesday. These parades are held mainly in the Rhineland region, the biggest of all being held in Cologne (Köln). It may be called “Oktoberfest,” but the big event actually starts in September, and has been celebrated every year since 1811. The massive Bavarian shindig is held annually in Munich, beginning on a Saturday in September and ending 16-18 days later (usually) on the first Sunday in October. Oktoberfest, as probably the world’s most famous beer festival (das Bierfest) gets off to an official start when Munich’s Lord Mayor (Oberbürgermeister) taps the first beer keg and yells the traditional O’zapft is! (‘It’s tapped!’), but there’s more than beer to be had on the 30 hectare festival site, with lots of fun rides, merry-go-rounds, carnival booths, food, entertainment and, of course, lots of massive beer halls sponsored by famous Bavarian brewers such as Paulaner, or Löwenbräu. All details and even the price of the beer can be found on the Official Oktoberfest website. Most of our ‘traditional English Christmas’ customs, only date back to the 19th century, and mostly originated in Germany, coming to the UK via Queen Victoria’s husband, the German Prince Albert. Christmas season gets underway on 6th December, St. Nicholas’ day, (Nikolaustag), when St Nicholas, comes with gifts of sweets for the children. This is also the traditional date when local Christmas markets (Weihnachtsmärkte) open in the main square of almost every town in Germany, some of the most famous are held in Nuremberg, Cologne or Munich, a full list of places and events can be found here. On Christmas Eve, there is no waiting for Santa, as presents in Germany come from the ‘Christ Child’ (Christkindl) are opened under the tree, followed by an evening feast, generally of carp and potato salad, with meat being reserved for Christmas day. Germany has a host of other special foods at Christmas time, with families often having special baking evenings for making spiced cakes, biscuits, such as Lebkuchen and Stollen as well as gingerbread houses. At this time of year you may also see on every house the letters C+M+B chalked above the front door, this represents the Three Kings (Caspar, Melchior, and Balthasar, plus the year), this is for good luck and to protect house and home for the coming year. To finish the year, New Year’s Eve (Silvester) is celebrated in customary style with fireworks and festivities. One unusual New Year’s custom in Germany is the annual prime-time TV broadcast of ‘Dinner for One’ a British cabaret sketch from the 1920s. This is virtually unknown in the English-speaking world, but the catch-phrase “Same procedure as every year” has entered popular German culture at every level. The biggest supplier in Germany is probably E.on but many companies offer an online facility (unfortunately only in German) for registering as a new customer (Anmelden). Check the website of your respective supplier. · Name and bank account details (for direct debits). Meters are read once a year. Consumption is generally estimated for the following twelve-month period. Bi-monthly invoices are issued stating the amount the supplier estimates the customer will need to pay to cover usage. These can be taken to the post office or bank for payment (or via direct debit). Following the annual meter reading, payments are adjusted according to actual consumption, and overpayment is reimbursed or additional payment is requested by the supplier (or your landlord). You will find mains gas in big cities in Germany, but elsewhere, you will be left to your own devices, which comes down to a choice of either (smelly) oil or (liquid) gas (LPG). If you are moving into an existing property, mostly that choice has been made for you by the previous owner/tenant. As these commodities go up and down with world market supply & demand, timing just when you fill up your tank needs a good sense of timing to get the best deal. As gas and electricity costs keep rising, many older buildings in Germany still have stove heating (Ofenheizung) usually fired by wood, briquettes or coal (also useful for burning rubbish to decrease the amount of household waste generated). Rental properties with stove heating usually have lower rents, most older properties with stove heating will have a cellar (Kellerraum) for storing fuel. Water in Germany is usually supplied by the local waterworks (kommunale Wasserwerke), to set up a new contract, contact your local town hall to register as a new client. In the case of rental properties, water costs are determined based on an individual usage and the charges are levied with the rent as part of the additional rent costs (Nebenkosten). In this case there is no need to set up an individual account. Most new properties have individual water meters, to give a more accurate record of usage. Drinking water and waste water are often charged separately. Deutsche Telekom (now known as T-Home) is the main service provider in Germany. To have a domestic landline telephone installed, connected or reconnected visit a T-Home customer services shop, there is usually at least one in the centre of most towns. As with all other services you will need to provide the usual proof of identity documents. Once you have a connection then you can shop around (e.g.Vodafone, Alice etc) for better deals. Competition in the Internet market in Germany is intense and, like all areas of the telecoms market, there is a wide range of companies offering services and promotional rates to new customers. It is advisable to look in detail at exactly what each provider is offering for the money in terms of connection speed, data amount included and any time limits or access restrictions to the Internet. Check also for clauses which commit you for a minimum period of time. Not all areas have broadband access, and speeds in villages can be surprisingly slow for such a technology-led country. One of the key things to remember in taking out any insurance in Germany is to shop around. As stated in the Driving section, find yourself a friendly broker, then just specify what you want insured and pay the premium. As in UK, German insurers can help you pay in instalments, so don’t be afraid to ask. In German this is called “Privathaftpflichtversicherung”. It is insurance in case you (for example) hit someone whilst riding your bike or knock someone down the stairs. Having such insurance is not a legal requirement in Germany but most Germans do have it and it is strongly recommended for expats as well, especially as it can cost as little as €40 per annum. PLANNING A RELOCATION TO GERMANY THIS YEAR, USE SCHEPENS! CONTACT US TODAY ON 01794 323558 TO DISCUSS YOUR REQUIREMENTS WITH OUR FRIENDLY STAFF.